The movie time on the web site was 8:00 pm. The movie time on the sign outside the building was 7:30 pm. They split the difference and started the show at about 7:45. With only one trailer (for Maggie's Plan, which we plan to avoid) and an ad, the actual movie started at about ten to. Which would have been okay; we were early, if we hadn't told friends to meet us there at 8:00 pm. But actually, movies are more of a sideline at the Blue Loon in Fairbanks, Alaska. The Blue Loon is a cool, funky space with a bit of a quonset hut vibe going. It's a bar and a restaurant and a concert hall, and four nights a week they show movies. The week we were there, they were screening (Wednesday - Saturday) Neighbors 2 at 5:00 pm (or 5:30?) along with our film for the night, The Meddler. By the time the movie was over, the eating area had a DJ (VJ?) at work along with the bartender, wait staff, and ticket seller. You could have a full meal and drinks at a table in the theater area, but we just had popcorn (a small popcorn, because they didn't have butter). 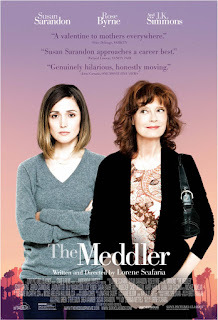 We enjoyed The Meddler, the story of a recently widowed woman (Susan Surandon) who moves near her daughter (Rose Byrne) so she'll have someone to occupy her time. The great J. K. Simmons does a fine job in the role that writer/director Lorene Scafaria must have imagined would be cast with Sam Elliott. There are no churches or clergy in the film, but an interesting point about the film was raised by the critic Mick LaSalle of the San Francisco Chronicle. So often screenwriters justify having characters do horrible things because they wanted to make things "interesting." Some actors talk about the villain always being the more interesting role. But LaSalle points out that Sarandon's character is good, genuinely trying to help others, but still an appealing and intriguing character. Good does not equal dull as a reading of the life of Christ makes clear. Mindy and our friend, Stephen, liked that the film featured chickens. The chickens enjoy music, particularly the stylings of Dolly Parton. Many find it an odd feeling to leave a movie matinee and walk out into the bright sunlight. Even stranger to leave an evening show (7:30? 8? 7:45?) and walk out into the bright sunlight. But this was Alaska in June.